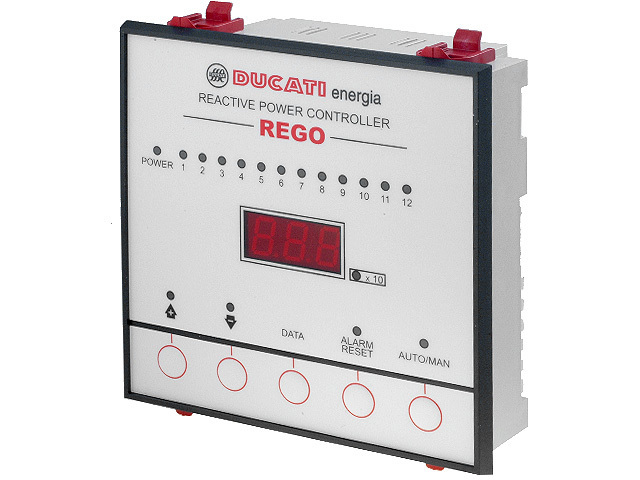 REGO controllers are designed for automatic adjustment of power factor through proper powering up capacitors’ batteries. They are characterized with a high resolution and accuracy in power compensation and intuitive operation. REGO12 is equipped with 7 up to 12 transmitting outputs with the switching power of 1500VA (250V AC). It can operate in the IT network allowing data exchange with other DUCATI devices. voltage control – signalling of increased voltage on transmitters, which maintains for more than 30 sec. The control is active at the capacitor’s battery switched on and off. thermal protection – activated when air temperature is above a pre-determined limit for at least 15 sec. protection against lack of voltage – transmitters’ switch off takes place when voltage fading lasts for at least 2 periods. When the voltage is recovered, controller automatically returns to its previous settings. REGO12 is equipped with RS485 port.